The whale shark, Rhincodon typus, is known as the largest fish in the ocean. They are blue-gray with white spots set between vertical and horizontal stripes. A whale shark's head is broad with a short snout and they have three prominent ridges along the length of their body. Whale sharks can grow near to 45 feet long, have mouths up to 5 feet wide and may live to be around 70 to 100 years old! The majority of whale sharks are around 25 feet long however. According to the IUCN Red List of Threatened Species, whale sharks are globally endangered. In Taiwan whale shark meat fetches a high price and whale shark fins are sold in various regions throughout Asia, especially being traded in Hong Kong. Sadly a whale shark dorsal fin could fetch $20,000. in the fin trade. Some countries have created ecotourism centers around whale shark seasonal aggregations and are proving that sharks are worth more alive than dead. Because whale sharks are slow growing, live for long periods of time and sexually mature later in life, they are highly susceptible to overfishing. ​Whale sharks are ovoviviparous or live-bearing: Embryos develop in a brood chamber receiving nourishment from a yolk sac. Pups hatch inside the mother’s uterus and are born soon afterward. Litters may be up to 300 pups, however survival rates are low due to overfishing. Perhaps 1 in 10 sharks make it to maturity. The whale shark is highly migratory, undertaking local and transoceanic migrations likely driven by feeding, breeding behavior and have seasonal migrations to spots where they may school. 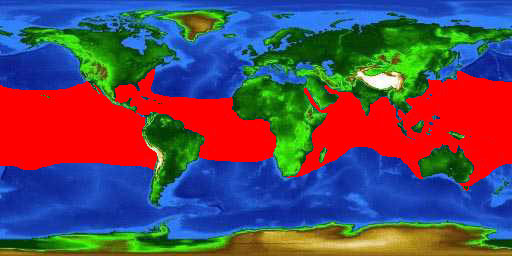 Whale sharks live in warm and tropical seas worldwide, although are not present in the Mediterranean. Whale sharks are filter feeders, often swimming near the surface filtering fish eggs, plankton, fish, small crustaceans and an occasional tuna or squid. Whale sharks have 300 rows of tiny teeth in each jaw which are not used. They use a suction filter-feeding method that works at a high velocity enabling them to capture a lot of prey. They can filter around 1500 gallons of water an hour! They usually feed in a near vertical position at the surface. Dermal denticles lining the gill plates and pharynx act like tiny sieves and trap any prey above 2mm in diameter. Locating food is likely driven by their sense of smell instead of sight, since whale sharks have small eyes located far back on their heads. ​Whale sharks are slow moving animals, but they are so big it will appear they are moving fast. Divers can expect that the whale sharks may swim right up to them and must pay close attention at all times. It’s easy to get focused on the sharks that are in front of you but don't forget to notice the ones behind you. It is illegal to touch a whale shark, so make sure to swim out of the way if one swims toward you. There’s no mistaking their large size and tremendous power, especially of their tail!